What is better than one week at Camp Metigoshe? The option to do three weeks for the price of one! 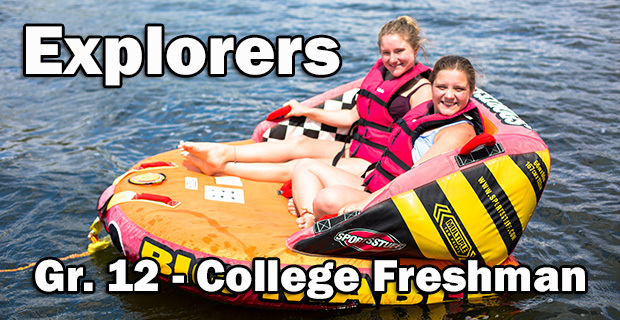 That’s right, as an Explorer you will have the opportunity to come to camp three weeks during the summer. Campers in the Explorer program get to enjoy all of the activities, fun and atmosphere of camp, while simultaneously learning what it takes to be a leader in a camping environment and beyond. The first week you will spend time learning leadership skills, dig deep into Bible studies, climb high ropes, go on some crazy awesome adventures, and build some tight bonds with your peers. You’ll have chances to canoe, go for a swim, play All Camp Game, sit around the campfire and many other classic camp experiences! You then have the option to come back to camp two other weeks during the summer. For one week you get to shadow a counselor and learn all about what it means to be a counselor, the other you can green peace by serving on our support staff. If you desire to grow in your faith, you won’t want to miss this camp experience!